[A1r] THE Second part of the troublesome Raigne of King Iohn, conteining the death of Arthur Plantaginet, the landing of Lewes, and the poysning of King Iohn at Swinstead Abbey. 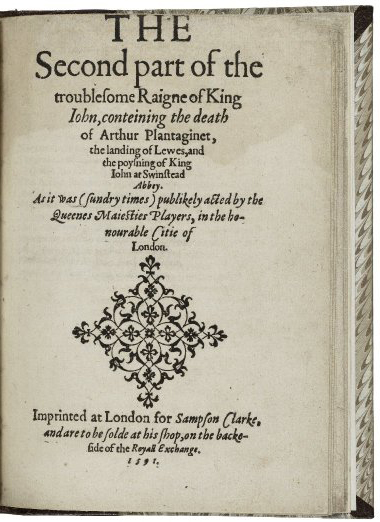 [half-title: A3r] The second part of the troublesome Raigne of King Iohn, containing the entraunce of Lewes the French Kings sonne: with the poysoning of King Iohn by a Monke. Imprinted at London for Sampson Clarke, and are to be solde at his shop, on the backe-side of the Royall Exchange. 1591. Title page imaged from Folger call number: STC 14644. Image is not from the transcribed copy.